It doesn’t take much to get seed started indoors. Fingers, mainly. The Seedmaster is a bit of a gadget from last year, not liked much at first, but rising on the tiny tool chart. You roll the yellow wheel, which clicks and causes the tool to vibrate, shaking seed down and over those little ridges (speed bumps) near the tip. At first, the wheel was stiff and the whole process seemed slow, but this year, it’s loosened up and once you get used to holding it at the right tilt for each type of seed, it definitely works faster for me than finger-pinching tiny seed. It came with four yellow inserts, with different sizes of cutout at the base to further slow down different sizes of seed, but I keep it fitted with the largest. The stainless steel transplanter tool acts like a shoehorn, and works great for popping out plugs when potting up (it’s all in that little bit of a curve!). The permanent marker and plastic plant labels are of course indispensable (DON’T GET MIXED UP!). 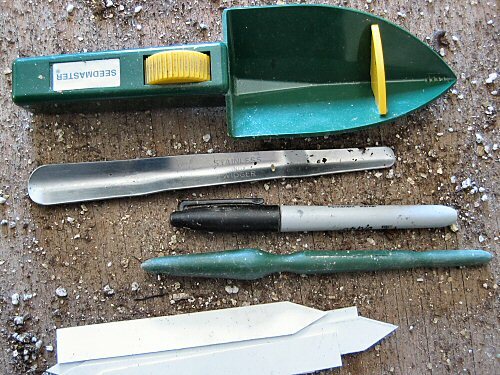 The green dibber (dibbler, pointy tool, whatever) is nice in principle: it comes in handy for poking little dents and holes, but fingers often work faster.